Academic literature on cities portrays urban residents as passive victims of migration related threats highlighting mainly their strategies in coping with it, strategies which are often not very successful. Using the case study of the Maasai migrants in Dar es Salaam – Tanzania, this paper purports that urban residents are not simply passive victims of migration threats but also deploy various capacities of coping with the threats. The paper examines various migrations related threats among the Maasai migrants to determine the migrants’ capacities of coping with the threats and recommend factors for enhancing such capacities. Based on the multi-layered social resilience framework, a qualitative approach was utilised drawing on 50 in-depth interviews, three FGDs, observations and a review of secondary data. 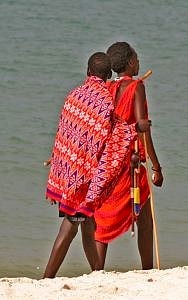 Threats experienced by the Maasai migrants include inadequate income and shelter, unemployment, oppression and exploitation. Migrants managed to solicit and utilise capitals from different social layers, thus developing ‘reactive’ and to a lesser extent ‘proactive’ capacities to competently cope with the threats. Specifically, migrants competently coped with the threats by utilising local knowledge and physical strength, social capital particularly rural-urban linkages and strong social networks among migrants. To a lesser degree, migrants also employed aspects of economic capital such as livestock and agricultural products at the household level, as well as symbolic capital such as the Maasai social reputation and identity springing from Maasai culture and local traditions. However, migrants lacked formal skills and education, as well as structures that could support resilience building at meso, regional and national levels. Thus, equipping Maasai migrants with formal skills, the changing of land tenure policies and making government and private institutions more responsive to the migration threats affecting Maasai can significantly improve migrant’s resilience against the threats.